The Leatherwoods. Artajona, Spain. 2006. It is hard to believe that it has been four years since I first went to Spain. In 2006, I visited three missionary families in three various locations around the country. This photo has always been a favorite of mine for its metaphor of beginnings and of new opportunities. 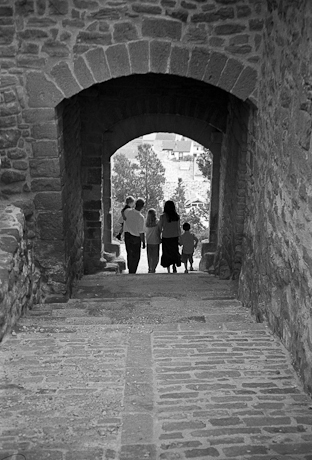 This family, the Leatherwoods, walked through this archway located in the 11th century Cerco de Artajona. I suppose that in comparison to the 900 years this structure has seen visitors come and go, my four-year absence has been hardly noticed. Yet, for my friends in Artajona, I am sure that the past four years have brought countless changes in their lives as they watched their five children grow. For me, those years have passed by in a blur as I have changed careers and embarked on founding and building my media mission, A Mission Proclaimed. It was a year after that trip I started A Mission Proclaimed (AMPProductions and AMPPhotos). Greatly inspired from that spring and summer I spent visiting my church’s missionaries as a media emissary for my church in my position as Director of Video Services. The intent was to gather stories of what was happening on the mission field and bring them back to the church to create interactive, multimedia “kiosks” for creating a greater connection between the church family in the states and those overseas. That project fell apart along with other church projects in the harsh reality of cutbacks and reorganization due to the faltering economy. The blessing of those factors, however, was that they were the impetus for my vision and creation of A Mission Proclaimed, to continue bringing the stories of God’s work in missions back to the people here at home. The revelation of having so much time pass brings some guilt that I have not kept in communication with the missionaries I visited. Being in constant “catch-up” mode and busily starting a new career while simultaneously building up a ministry takes a toll on the cultivating of friendships. I suppose it is out of guilt that I vow to reconnect with those friends and to cultivate those friendships that I started over the last few years. Priorities, priorities, priorities. Get them straight. In my hope to realize the metaphor pictured by the Leatherwoods as they walked through that stone arch four years ago, I commit to treating each day as a new beginning, a gift from God, and an opportunity to greet each new day as a blessing to enjoy friends and cherish friendships that God has given me.